Decentralization is everywhere around us and yet we cannot say what, if anything, it achieves. Proponents argue that it will deepen democracy, improve public services, and make government more accountable. These intuitions have prompted a massive policy response across the globe, with an estimated 80-100 percent of the world’s countries experimenting with reform. But careful research has not found that it achieves any of these goals. Is it all empty fashion? A giant mistake? 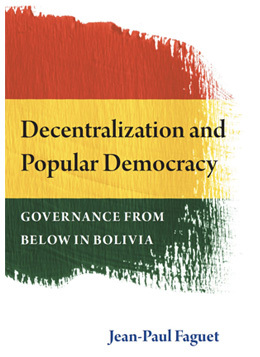 In Decentralization and Popular Democracy, Jean-Paul Faguet uses the remarkable case of Bolivia, a radical reformer over two decades, to investigate what happens when a country decentralizes. The answer is remarkable success leading to transformation. Public investment shifted dramatically towards primary services and human capital formation, while the distribution of resources across the nation became much more equitable. These changes were disproportionately driven by Bolivia’s smaller, poorer, more rural municipalities investing newly devolved funds according to greatest need. The accumulation of such micro-level changes led the Bolivian state as a whole to become more responsive to citizens nationwide. But these successes are only the beginning. Some municipalities responded to decentralization with transparent, accountable government, while others suffered ineptitude, corruption, and worse. Why? In order to discover the causes of good and bad government, Faguet drives his investigation deep into the political and social underpinnings of governance. He deploys statistical evidence covering all of Bolivia’s municipalities, territory, and citizens over twenty-one years, alongside deep qualitative evidence based on fieldwork that ranges from the altiplano to the broad Eastern plains, and from the smallest hamlets to the richest industrial cities. His results show that governments are responsive and accountable when civil society is rich in active, organized groups, and these groups compete with economic interests for influence over policy decisions. The interaction of civic and economic actors is especially important, resolving differences between them and often modifying the priorities of each. Where more interactions occur, Faguet demonstrates, government outcomes are systematically better. These insights are used to construct a theory of government that explains why some democracies succeed and others fail. It also explains how governance can be transformed over time. Decentralization is not a policy lever, but rather a process that operates at deep levels of politics and society. The long-term changes that it kicked into motion in Bolivia proved even more important – and dramatic – than the initial positive results. Decentralization and Popular Democracy tells the story of the transformation of a country’s government, the collapse and re-birth of its politics, and the rise to power of its people through a trapdoor unlocked by decentralization.